Between 1977 and 1979, David Bowie released three albums that came to be known as “The Berlin Trilogy.” Despite the fact that only one of them was fully recorded in that German city, these albums reflect the influence of German “Krautrock” bands like Kraftwerk, Neu! & Can. In the past when I’ve listened to these albums, I enjoyed a lot of the music but never completely embraced them. Fortunately, in the past few years I’ve grown to love the aforementioned Krautrock bands. Also, after finally discovering the beauty of his prior album, Station To Station (which I discussed in the previous post), I was primed and ready for the non-commercial charms of this trio of albums…and I was not disappointed. 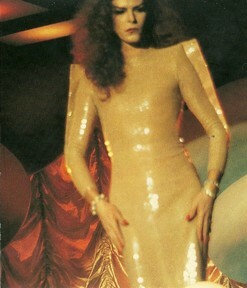 All of these albums were produced by Bowie and Tony Visconti (who worked with him on several of his earlier records), but the most notable addition on this trilogy is former Roxy Music sonic architect, Brian Eno, who brings all kinds of synthesizers and other strange sounds to the proceedings. Beginning Low (1977) with the instrumental track “Speed Of Life” was a bold statement. At a time when most artists still opened their albums with the most chart-friendly song, Bowie was clearly interested in artistic expression over commercial success. This is a great tune that stomps & swings, with lots of Eno’s synth treatments and a couple of catchy guitar hooks. It’s followed by “Breaking Glass,” a brief song featuring abstract lyrics, a great beat with synth washes and a fantastic guitar hook. It was co-written with drummer Dennis Davis and bassist George Murray, which explains the cool rhythm throughout. 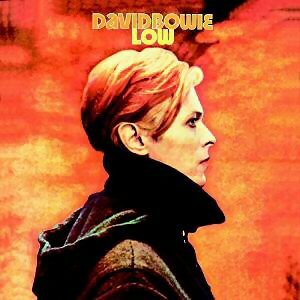 Later that year, singer Nick Lowe (still a relative unknown) recorded an EP called Bowi, with tongue in cheek, as a response to this Bowie album title. I wonder if he was inspired by this track when he recorded his now-classic early single, “I Love The Sound Of Breaking Glass,” the following year. 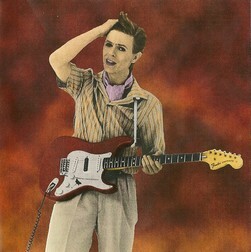 “What In The World,” a driving rocker with squealing guitar, has an early Roxy Music feel, which isn’t surprising considering Eno’s contributions. The first truly breathtaking song here is “Sound And Vision,” with an amazingly funky rhythm (thanks to a killer bass line) and great percussion and synth effects. I love how his voice alternates between low & high, and the way he harmonizes with his own voice, as well as the vocal hook at “blue, blue, electric blue.” In an earlier post I mentioned Bowie acolyte Edwyn Collins (who had a mid-90s hit with “A Girl Like You”). I’m also a fan of his pre-solo work with the band Orange Juice, and now it’s clear to me that much of their recorded output can be traced to this particular Bowie song. I love making these kinds of musical connections. The most straightforward song here is the piano-driven “Be My Wife,” which sounds like his earlier glam-rock records. It’s very sparse, with just one verse & chorus repeated once, and has some of his most simple and heartfelt lyrics (“Please be mine, share my life, stay with me, be my wife”). Two songs with steady beats and cool sonic effects that didn’t make huge impressions on me are “Always Crashing The Same Car” and “A New Career In A New Town.” The former is good but not as essential as the first four songs, and the latter just didn’t stick with me after numerous listens (although I do love the pulsing electronic rhythm). The album closes with four songs that are essentially instrumentals. My favorite of these is “Warszawa” (it does have some chanted vocals, but they don’t come in until about 4 minutes into the song). It’s moody and eerie, with a haunting synth melody that sounds like a flute. It’s obvious that this was the blueprint for Gary Numan on his slower, more atmospheric songs. Also, one of my musical heroes, Joe Jackson, used this sound to great effect on songs from his 1994 album, Night Music. I think Joe was listening to the next song, “Art Decade,” at that time as well. It continues the eerie feel of the previous track with another haunting tune. Apparently the title was a play on the term “art deco,” but I think it’s also a pun for “art decayed.” It didn’t seem like he had a sense of humor during this era, but apparently he did. “Weeping Wall” is lighter and airier than the two previous songs, with lots of percussion flourishes and a pulsing, motorik rhythm. “Subterraneans” closes the album with a spacey, Pink Floyd vibe (circa The Dark Side Of The Moon), especially with that saxophone melody. There are a few abstract lyrics, but it’s more about creating a mood than telling a story. This is an album that rewards listeners with each listen. As much as I’ve come to love it the last two weeks, I expect it will continue to grow on me in the coming years. 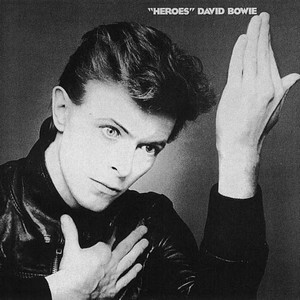 The only album recorded completely in Berlin, “Heroes” (1977) follows the template set by Low, but smoothes out some of the rough edges, and even includes one of his most beloved songs. Also, King Crimson leader Robert Fripp adds his inimitable lead guitar sound throughout the album. Before discussing the music, I’ve always been curious about why the album title has those quotation marks. Is he saying that the heroes in question are not really heroes in his eyes? And who are these people? Let’s jump to the title track, “Heroes,” which is the third song on the album. It seems to be about two lovers who are constantly torn apart no matter how much they want to be together. The final verse implies that they’re from opposite sides of the Berlin Wall, which might explain the obstacles in their relationship. Regardless of the meaning behind the song, the music is amazing. The tune is super-catchy, the synth heavy production is stellar, and Bowie’s vocal performance is among his best. It’s rightly considered a classic. Now back to the start of the album, and opening track “Beauty And The Beast.” This song takes the fun, funky groove of “TVC15” to a new level, adding in slightly distorted vocals and a cool vocal hook (“You can’t say no to the beauty and the beast”). Talking Heads would soon be incorporating this funky sound into their music. “Joe The Lion” is another excellent song. His voice has a manic, crazed and yet controlled sound. One of the highlights of this album for me was “Sons Of The Silent Age.” It starts off like one of Roxy Music’s dramatic tunes with blasting sax, but the rest of the tune is midtempo with swirling synth sounds and dramatic rhythms. I love the watery vocal sound when he sings the title, and there’s a great hook in the chorus (“Sons of sound and sons of sound”). I don’t really know what this one’s about (I guess that could apply to most of this trilogy), but this song made a lasting impression. Eno is all over the fast rockin’ “Blackout,” but other than the “kiss you in the rain” refrain, there’s nothing terribly catchy here. The second side of the original LP consisted of four instrumentals before ending with a vocal track. The saxophone melody on “V-2 Schneider” sets it apart from the obvious influence of Kraftwerk, but even the title references their founding member, Florian Schneider. This one is all about mood. “Sense Of Doubt” is actually scary (but in a good way), especially that descending 4-note melody. The synth part reminds me of Genesis’ “Watcher Of The Skies,” but like the previous track, it’s more “sound effect” than song. “Moss Garden” is given a Japanese feel with Bowie playing koto. It’s a peaceful tune with slow whooshing synths and chirpy sound effects. There are more creepy sound effects on “Neuköln,” with synth and sax intertwining. At times the keyboard tone, as well as the whale sounds at the end, recalls Pink Floyd’s “Echoes.” The album closes with the funky and mildly hypnotic “The Secret Life Of Arabia,” a vocal tune with a chugging groove and a great Bernard Edwards-esque bass line. Like its predecessor, this is not an easy album to digest, but its beauty is revealed a little more with each listen. I love it now, and I expect that to grow over the years. 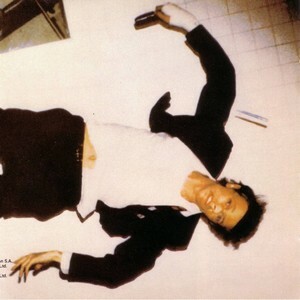 The final album in the trilogy, Lodger (1979), has several qualities that set it apart from the previous two. First, there are no instrumentals among its 10 tracks. The Krautrock influence is less noticeable, with other musical flavors popping up. Also, taking over lead guitar duties is Adrian Belew, who was working with Talking Heads at the time, and would join Robert Fripp in a revamped King Crimson a couple of years later. He has a distinct style that is instantly recognizable on several of these songs. The album opens with “Fantastic Voyage,” a pretty midtempo ballad with a strong vocal performance but downbeat lyrics (“We’re learning to live with somebody’s depression”). “African Night Flight” is a percussive track with processed piano sounds and Bowie tearing through the lyrics at a breakneck pace as though his life depended on it. Belew would use this rapid-fire vocal technique on King Crimson songs like “Elephant Talk” and “Thela Hun Ginjeet.” The vocal hook here is “One of these days, one of these days, gotta get a word through one of these days.” I enjoyed the chugging & galloping rhythm in “Move On.” Bowie uses his crooner voice early on, growing more manic later in the song (“I stumble like a blind man, can’t forget you, can’t forget you”). It’s not a major song but I love his vocal performance, especially the layered harmonies. “Yassassin” floored me from the first time I heard it. It has a sort-of reggae feel with a Middle Eastern flair in the vocals, and a great violin melody played by Simon House. “Red Sails” is a driving rocker with a thumping beat that could’ve fit on an earlier album like Diamond Dogs. I love that Belew guitar squeal. I bet this tore the house down in concert. Is it possible that Talking Heads influenced Bowie on “D.J.”? Sonically & rhythmically it has the hallmarks of those art-rockers (whose catalog I covered last year), but the chorus (“I am a D.J., I am what I play”) is pure Bowie. One of the highlights of this album is “Look Back In Anger,” a driving rock song with a memorable backing vocal hook (“Waiting so long, I’ve been waiting so, waiting so long”) and Bowie’s pleading when he sings “Look back in anger!” Dennis Davis’ drumming is the engine behind this song. The guitar tone during the instrumental break reminds me of David Gilmour on his 1978 self-titled solo album. “Boys Keep Swinging” recalls “Heroes,” but with a different vocal approach (“When you’re a boy, you can wear a uniform”). There’s a cool, angular Belew guitar solo, and I love the backing vocals by Bowie & Visconti. The steady, stomping 4/4 beat and monotone vocals on “Repetition,” as well as lyrics that address the everyday/mundane, point yet again to David Byrne and Talking Heads. Who was influencing who at this point? Album closer “Red Money” is a new favorite. I like the funky groove, the guitar textures from Belew and Carlos Alomar, and the robotic delivery of lyrics like “Project cancelled, tumbling central, Red money.” The bonus track on the Rykodisc CD, “I Pray, Olé,” with its memorable “Can you make, can you make it through” hook, is a pretty good song that would’ve fit on the album, but isn’t essential. I probably sound like a broken record at this point, but this is yet another album that became more enjoyable each time I played it, and I expect that to continue in the future. These three records may not have been planned as a trilogy, but they do work as a cohesive trio even though each album has its own unique charms. I certainly can’t choose a favorite. Low introduced the sonic template, as well as the mixture of vocal & instrumental tracks, and has a few amazing song. “Heroes” took it further, but even though I love several of those creepy instrumentals, I have to be in a certain mood to really enjoy those tracks. Lodger has more consistently great songs, but it’s not as sonically consistent as the other two. I guess it doesn’t matter whether or not I have a favorite. The important thing is that I now know these albums better than ever, and this era of his career is no longer a question mark for me. Now it’s time for me to revisit his first few albums of the ‘80s, including his biggest commercial success as well as one that I’ve often considered my favorite Bowie album. It’ll be interesting to see how they hold up against new favorites like Station To Station and The Berlin Trilogy. I’ll be back soon to let you know how that turns out. 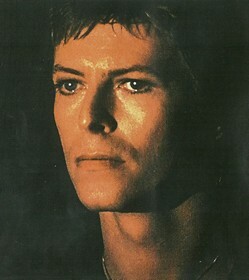 Just a note to say I’m enjoying your Bowie series. My old roommate had a more-or-less complete collection, and after Station to Station and Hunky Dory, it was the Berlin albums that I raided most often. One confession, though: I must be the only person in the world who isn’t crazy about the song “Heroes.” But like I have to do with certain foods, I’ll try it again. You never know when something will click, right? 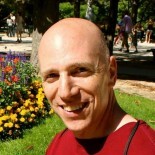 Hi Glenn. Great to hear from you. Happy New Year. I know what you mean about “Heroes.” In the past it’s never been among my favorite Bowie songs (although I never disliked it), but hearing it both in the context of the album and as part of the Berlin Trilogy, I gained a new appreciation for it. How far into his catalog have you gone? I know the ’80s, especially after Let’s Dance, is not the favorite era of most fans & critics. That’s what I’m listening to this week. Rich, I’ve heard everything from The Man Who Sold The World through Tonight multiple times. The albums after that I’ve only heard once or twice each. This may say something about Bowie’s music but in my case there’s a practical reason as well, as my roommate got married in 1987 so after that I didn’t have 24/7 access to his music collection. Another great write-up Rich. You have me excited to revisit “Lodger” in particularly. Brian, I’ll be curious to hear your thoughts when you revisit Lodger. It never really made an impact on me, even though I’ve listened to it several times over the years, but now I love it. Agree with you about ‘Lodger’… The murky mix and sometimes deranged vocals can be pretty forbidding but it definitely gets better with each passing year… ‘Fantastic Voyage’ must be the most underrated song in Bowie’s canon. Hi Matt. “Fantastic Voyage” is definitely a candidate for most underrated/undervalued song in his discography. Mojo magazine recently ran a feature on the 100 Greatest David Bowie songs, and it’s amazing how many non-commercial tracks were included. They could probably come up with another list of 100 and it would be equally interesting & diverse. 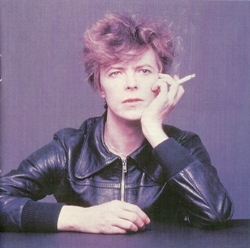 The Bowie catalog remains my favorite of everyone I’ve revisited for this blog. Only one of those three songs made it into my discussion of the Tin Machine albums. It’s been a while since I revisited his discography so I don’t remember why they didn’t make the cut, but I gained a huge appreciation for those two albums and still can’t understand why there was such a backlash against Bowie at that time. It’s not like he had done just one sound through his whole career and then made a huge change. His entire discography is about changing, morphing, exploring, stretching, etc. Tin Machine was just another step in that journey. I wonder if the reaction would have been as harsh had they been released as Bowie albums instead of under the band name. People often forget that the first Tin Machine album had quite a good critical reception, especially in the UK, and I think it sold pretty well. To my ears, the second album is a great improvement on the first though, despite the horrific ‘Stateside’ and ‘Sorry’. As for the live album, it’s pretty strong beer, quite hard to get through with loads of quite aimless jamming, but there is a brilliant version of ‘You Belong In Rock and Roll’ on there which is well worth hearing. I didn’t mind “Stateside” and “Sorry” even though they stick out like a sore thumb with Hunt Sales on lead vocals. As for sales of the albums, I’m not sure how they did in the US but I remember a big backlash from Bowie fans & critics at the time. I wasn’t enough of a fan to check them out until several years later, so buy the time I heard them they were just catalog titles and not “new” Bowie music. I’ll have to seek out the live album one of these days just for that version of “You Belong In Rock And Roll” even though it wasn’t a standout track on Tin Machine II for me. I’m so excited to see you review these I can’t say anything intelligent here as these are three of my favourite Bowie Albums of all time- (though I have many.) Glad to see you’ve also revisited Scary Monsters and Outside, which are some where up there in my top ten, and seriously underrated by the wider world. see, I’m off on one. …. Of all the batches of albums I’ve revisited & written about in the last couple of years, the “Berlin Trilogy” is possibly my favorite, and certainly it’s the group of albums I learned the most about. I barely knew them before spending that time with them, so it was incredibly rewarding. I can’t disagree with you regarding the fact that it may not even be a trilogy, and none of them would’ve existed without Station To Station (which may have become my single favorite Bowie album). There’s no doubt that he was on a roll at the time. Glad to hear you also love Scary Monsters and Outside. The former is pretty well-regarded, but the latter seems to be forgotten. If even a handful of people have checked them out for the first time after reading my posts, then mission accomplished. Thanks for commenting. It’s always great to hear from another fan, and I’m glad I got to re-rev your enthusiasm for this music. Cheers! I grew up hearing Bowie ( initially because of older brothers) but became a huge fan by choice in my teens – just in time for OUTSIDE. I’m used to listening to back catalogue and new concurrently! Funny, of all his later albums you could have picked Buddha of Suburbia (you heard that one?) and Outside are closest to the ‘Berlin Trilogy’, in terms of sound, experimentation and a very Eno approach to production. So if you like one you’re bound to like the other, in my book. I envy you for growing up with Bowie’s music. I had to come to it on my own, and other than a handful of albums I didn’t truly embrace his entire output until I began revisiting it in late 2011 & writing about it here. Just to clarify, I have no problem listening to new & catalog releases at the same time. It’s just that I’m an “album guy,” so I try to avoid listening to singles more than once before an album’s release. I prefer hearing all songs on equal footing. I completely agree with you about Outside and Buddha Of Suburbia (which I heard for the first time & wrote about in my 7th Bowie post) being closest in vibe to the Berlin Trilogy. As for Station To Station, it’s an album that got better with each listen, and I expect to love it even more 5-10 years from now. Out of his entire catalog, it’s the one that surprised me the most. I look forward to seeing your artist portraits. I’ll be curious to see where else our musical tastes intersect. No worries…there was no offense taken. I originally came to Bowie’s catalog in a non-linear way as well, but it wasn’t until I went through the discography in chronological order that I really appreciated everything he’s done in his career. Repetition is not just about the mundane, its about domestic abuse and its pretty obvious if you listen to the very simple lyrics (probably the most straight forward track on the album). Also, its worth mentioning that Red Money is essentially a cover of Sister Midnight by Iggy Pop which Bowie co-wrote and produced with Pop and Carlos Alomar. Thanks for the input, Pete. Didn’t make that connection with “Repetition.” I’ll have to go back & reassess it. I haven’t delved enough into Iggy’s catalog, other than the first three Stooges albums and a compilation of his solo material. I will look into “Sister Midnight”/”Red Money” based on your comment. At the very least, I need to get the Iggy albums recorded during this era. Glad I’m not the only one who notices that. It doesn’t take away from my enjoyment of Orange Juice or Edwyn Collins, though, as it just reinforces the connection between two great artists. Love your site. I’ll be subscribing after finishing this comment. Me again. The Berlin lps have their own shelf life, all the myth and murk of their making and so on, but I just want to add how odd they were on release, and how Bowie was sort of in limbo commercially until Scary Monsters got him back in the spotlight. STS and Low have the Man Who fell To Earth as their cover images, and he’s never looked more alien and more himself at the same time.As a kid I heard Sound and Vision on American Top 40 in 1978, it entered at #38 and against Foreigner and Journey and Debbie Boone it sounded incredible. I thought it’d be # 1 by the next week…oh well. Joy Division called themselves Warsaw originally, after the Low track. There’s an Eno doco on youtube where he says Fripp and Bowie were having issues with Heroes the song, about how to sonically get what they knew to be there. Apparently, Eno brought the Walker Bros Nite Flights lp back to Berlin and played it to Bowie. The Electrician from that lp is somewhere near the Heroes sound, though both lps were from 1978 I don’t know how accurate this story is. Eno confirms his love of Scott Walker and his sonic assualt on that and later records, and Bowie would cover Nite Flights on Black tie White Noise, but it sounds right. Interesting anecdote about a possible Scott Walker influence on this portion of Bowie’s catalog. I’ve only been vaguely familiar with Walker & his work with The Walker Brothers, although I recently got a copy of the Scott Walker 5-CD anthology that I’ve been slowly making my way through. There’s no doubt that Walker’s crooning vocal style must have had some influence on Bowie. I’m not surprised that these albums weren’t well-received, at least by a mass audience, at the time of their release. They seem like the kind of releases that gain traction as time goes on. Between this trilogy and “Station To Station” I found a portion of his catalog that completely blew me away and made me become a much bigger fan overall. In fact, I often cite Bowie as the biggest turnaround for me of all the artists I’ve covered here. I always enjoyed his music, but giving it the attention I did over several months made me realize how brilliant he is…even his lesser material. Hi Bridgeen. Thanks for revisiting this post. I hope it was helpful in your recovery. I haven’t played Low since I wrote this series, so it’s possible that my opinion of those two songs will be different the next time I hear them. I usually play each album I write about 3-5 times (and sometimes more than that), so by the time I share my feelings I know the songs really well. But I also know that opinions can change over time, and of course everyone is impacted differently by music. I’m glad we share a love for these albums. I love your point about certain Bowie albums being like post-Roxy Eno without the Eno. I’m going to ponder that for a while. I can totally hear the “off-kilter rock and roll” connection you’re talking about, but I will make it a point to play Scary Monsters and Here Come The Warm Jets back-to-back soon so I can hear the similarities. Isn’t incredible how poetic Bowie’s death was? It’s sad, of course, but in some ways he turned it into an art project. That keeps him and his music alive for all of us. I will always hold out hope that there will be another Bowie or Freddie Mercury in our lifetime. He/she may not have the same impact on us as those artists, but if future generations don’t have their own all-time greats then I feel very sorry for them. I would feel sorry for them too! I guess they can’t miss what they never had. We’ll know in 10-20 years if there are any artists out there now who were life-changing to this generation’s real music lovers. There’s bound to be some (i hope). Like Florence and the Machine maybe? I’m just cut up from too many of my heroes dying lately. Man it’s making me feel old. It’s definitely sad to see so many of our heroes dying, but of course it’s not surprising. Many of them did a lot of damage to their bodies in their early years, and the fact that they’ve lived to 70 or more is pretty amazing considering how much mileage they had accumulated. Of course, that doesn’t take away from the sadness, and I’m sure I’ll be devastated whenever the guys from Led Zeppelin, Pink Floyd, The Stones, Yes, etc start going. Hopefully they all live into their 90s, of course. I fully agree. Low is great, but still feels a bit like trading water when compared to Heroes, the true Berlin masterpiece. I’m not sure the difference between the two records is that drastic, and I don’t agree that Low feels like treading water in comparison, but perhaps Robert Fripp’s typically amazing guitar work on “Heroes” is the X-factor that sets them apart. This entry was posted on January 7, 2012 by KamerTunesBlog (by Rich Kamerman) in DAVID BOWIE and tagged "heroes", berlin, berlin trilogy, david bowie, kamertunes, kamertunesblog, lodger, low, music, music blog, rich kamerman.